Bayu Ferringhi Condominium sits on higher ground at Batu Ferringhi, the latest upcoming development in Penang by Plenitude Berhad. A spectacular freehold development overlooking the sea sited on the prime stretch along Batu Ferringhi Beach in Penang. Built-up Area : 1,777 - 5,872 sq.ft. The clubhouse open deck offers lifestyle facilities such as swimming pool, children’s pool, tennis court, gymnasium, jacuzzi, children’s play area, roof top recreational terrace and residents’ lounge. Security for the residents is 2 tiered with guards and CCTV monitoring of the common areas and car parks. May I know how much is the smallest unit and year of completion? 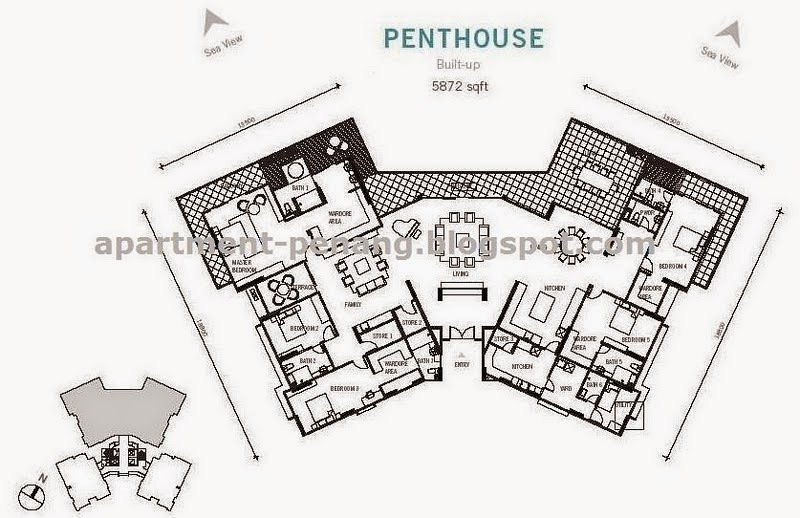 Can I know the floor level of penthouse is? Since club house is on the top, so is the quiet environment of the penthouse will be affected too? How much is one unit of the condo -penthouse? looking for a seaview dream home, this is a good project to be consider. All unit of the condo are seaview. Price min $430 per sq ft and more for higher floors. And it is not even on the beach. This project is definitely overpriced for today's bad economy. Can you define over priced ? What is the land cost ? The construction cost for building a design like this ? How much are similar properties with sea view cost along the same road ? Oop! it's $430 per sq ft onwards. Yes "The Cove's Master Bedroom has a larger balcony and bathroom has a private sauna/steam room with walk in wardrobe, His and Hers basins but FH master's has no balcony,1 basin, no walk in wardrobe and a much smaller bath room. Compare the $300 and $430- It's $130 more for less. Isn't the F.H. over priced??? bayu ferringhi's views are unobstructed. nothing against plenitude or the cove residents. since u are so pro The Cove, do pay a visit to the local council and ask around about the old tanjung country club. y dun u do every1 a favour and compare bayu ferringhi and the cove fairly? perhaps u are not aware that the tanjung country club land is sold and 2towers hv been approved, but the developer is reapplying for 4 towers. since no one is talking about this, or is not aware of this, perhaps we shd pay a visit to the cove website and ask for their comments there? 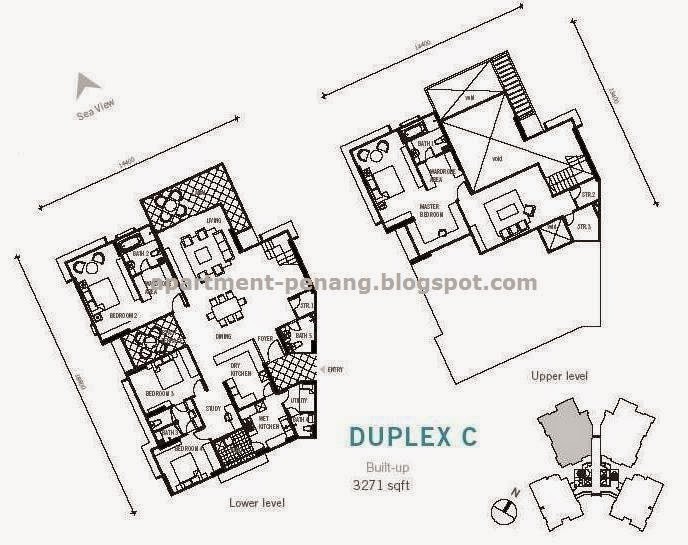 Penang, FB Condo is on a "Hill Slop[e Property" and on the Beach Property is more desirable. Recent issue of landslides for on the slope properties make this project less attractive with eminent dangers. You know that so to paying $430 to $550 per sq ft is unreal. Beside this condo has no direct access to the beach divided by a busy highway. Another thing to note is that having fewer units means the maintenance fee will go higher after 3 years. perhaps you can enlighten us readers here how you come up with the calculation on the maintenance fees which will go up after 3 years? this is something new to me, and i would like to learn a few tricks from you. by the way, i visited the show village a few weeks ago, and the prices are between 428-470psf depending on the height of the units while the landed are priced around 400psf. where does the 550psf come from? please at least get yr facts right. in the master bathroom of the B units, there are 2basins, for his and hers. there is also a little walk-in wardrobe. everyone will surely agree with me that the master bath and the walk-in wardrobe in bayu ferringhi will definitely be smaller than the cove's, we are comparing 2400sf against 6000sf. isnt that obvious? with all the extra spaces in the cove, i am sure balconies can pop out anywhere, dun you agree? hill slope projects have their own advantages when its built correctly. alila horizons is a good example of a successful hill slope project. not all beach front condos in penang are good anyway, since you like to use the cove as a comparison, i remembered clearly when i visited block D last month, i was very impressed with the view and the layout itself. when i asked the agent about the access to the beach, i was surprised when i had to walk down the 'proper' steps/stairs with overgrown grasses 'lalang' before coming on to some rocks, then the sandy beach. i am not sure if i have the confidence of walking my kids to the 'private' beach alone. my personal view is all properties in penang have their own goodness. as long as u believe it works well for you, then its yrs. price wise, i have to agree that the cove is much cheaper comparing psf, but not every purchaser will buy the cove just because its cheaper. i know of some friends buying the infinity at average 450psf and they do not complain. my cousins bought the coronation springs at 500psf which is around 600-750psf now, and i do not hear them cry. a few friends of mine bought skyhome at 380psf which is about 450-500psf now and they are still smiling. if u do not have anything personal against plenitude, then do your comparisons fairly. why dun u compare bayu ferringhi with island resort? it was sold at 300psf a few years back, and now the developer claims its worth 450-500psf. no work has started, many purchasers have withdrawn, excuses on the land owner, excuses on the delay of stamping the SPA for over 16months now since january 08.
i read numerous ideas and thoughts shared by yrself and other bloggers in other sites. some are really good, some are a TOTAL waste of time reading them. i realise when the writer does not like something, 'WHAM' there he goes, bringing down the developer. we readers are interested in something more mature, useful information, guidelines to purchase the right property rather than just complains, back stabbings, emotional slanders and unsupported facts. i look forward in reading more of your constructive sharings soon. You should check what you write. Type B master bedroom has only 1 basin. Look at the plan on this page. Where does it show 2 basins? Further my speculation on sustainable maintenance fee for smaller condos are based on common sense. The more units the cheaper the monthly charge as there are more units to split the cost. BF is a single block hence the monthly fee will go up after 3 years when time shows aging with wear and tear. The location and being on a hill slope does not reflect the $430 per sq st and onward rate at all especially during this recession period. The Developer is just out of touch. No wonder they are begging for buyers! No one is buying which is a fact. Many units remain unsold. Please check with the sales office to verify this. all your assumptions are accurate! You bet! Sales of luxury condo are going down further so unless Developer lower the price. They ain't getting any sales. People would only buy unless it is lower then prevailing market value. I think the prevailing value of condos like this BFC should be around $350 per sq ft. In order to get interested bargain hunters to commit it has to be around $320 per sq ft or less. My family and I visited the sales office last weekend and asked the sales rep regarding the basin for the master bathroom. They told us that there will be 2 basin, his and hers. My wife requested for the copy of the sales and purchase plan and it indicates 2. Penang Lover probably did not verify his or her facts. As for the sales, most of the top floors of type b are almost gone. By the way, since Penang lover is an expert in Penang Property Market, what is the going rate for Miami Green unit which is empty per square foot today. 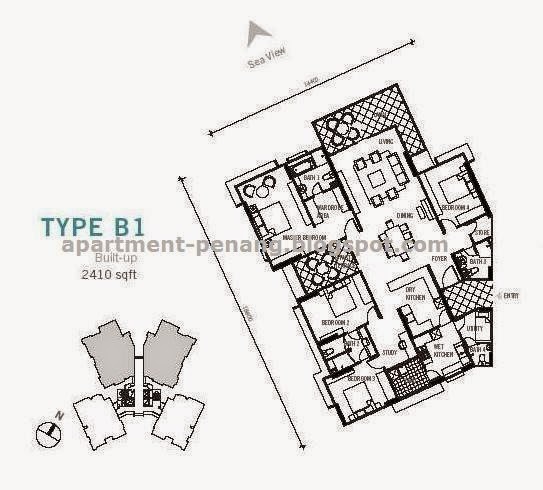 Hi Expat, I said it the Master bath for line B has only 1 basin based on the floor plan supplied here. I think even if they put in additional basin it is very cramp. See the plan of the bath room. It is very small for a 3/4 and above million dollar condo. I am obsessed with bath room so I noticed such things. I bought a unit at Platino Luxury condo and those are the standard I go for. Separated shower, toilet and a large long bath for Jaccusi. As for Miami Beach I won't pay more then $300 per sq ft max. It is a much older condo- built in 1999. Thank you Penang Lover. I took your expert advice. My wife and I went to Platino site and thereafter their office. There are 2 blocks in front which is Bayswater. Plus I see some more blocks coming up on the left. It is also away from the sea. Much further than Bayu. I think there should be at least 300 to 400 units plus there. My wife and I personally dont think this is an exclusive developement. However, our expat friends do tell us IJM is a reputable developer which we agree. We will certainly go for Bayu. Only 1 block, thanks for your advice. Well Expat, it's your money and your decision. I bought Platino because it cost $15 to the Airport(skip traffic jams all along along), it is near the bridge and the industrial estate beside the future "Lights" billion dollars sea front project and Tesco is within walking distance. All these enhance future desirability- rental or sale. I find BF up in the Hill too remote and the convenience of shopping in not there. I like to have such convenience of not cooking and walk a few minutes to a restaurant(Sea Gate) or get some prepared meals from Tesco. Living in Platino with big swimming pool, gym and sauna. 4 seasons gardens and a large sprowls of land around with reflection pools is resort style living. Also hospitals are near in case of emergency beside there are accessible public transport and near the main bus terminal. All these put into consideration. I can give up exclusivity. Unless you are happy with the view and nothing else go for BF Condo. It's like living in an ivory tower.I hate taking a bus and having to walk uphill with shoppings to BF Condo if my car is out. It's no fun. invest or whoever obnoxious person you are. Kindly tell me what facts have I presented wrongly from this blog? I am entitle to my opinion and so are you. This is a free world. I was only merely replying to Expat who ask me for advice. I did not need your opinion. Who cares what you think. You are way out of line accusing me of such. So I am also "Young Durian". You are crazy. Bet you are a "good for nothing" old retiree who has nothing to do but going around writing blogs to flame bloggers that does not agrees with your line of thinking. anyone know the progress of this condo ? Hi King, sorry no show unit as yet, but you can visit their Sales Gallery to check out the scale model house for ideal. How is the progress of the project ? Anyone have idea of the price ? is it true ? how many % ? I was asked to give a non bias comment on this piece of property by Sareena. The task given to me is certainly not easy. there are plenty of other developments that you can buy. Hillside development has its pros and cons. 1) Global warming is a very big issue affecting the world right now. The ice caps in Greenland is melting faster than we can imagine. If we were to ban all cars in the world today the ice caps in the world will still be melting. At the rate we are emitting carbon dioxide into our atmosphere it is just a matter of time before the sea levels rises. The benefit here of owning a hillside property is that you don't have to worry about this issue. 2) Feng Shui is a funny thing, this whole project evolves around this concept. A balance of peace and harmony. People are willing to pay a lot of money for this. Hence, we need to ask ourselves, is there a fix price for this? I believe many will say this would be priceless. If the developer claims that every single unit is orientated to provide optimum sea view,natural lighting and cross ventilation, what else can we say? If it materialize then it is worth it. It is similar to reclaim land but obviously better in terms of land stability. However, there will be the question of "will there be a landslide in the future". After all, the area where they are building the properties use to be a water catchment area. All i can say for now is the chances of a landslide vs rising sea levels. Tg Bungah Hillside,Ferringhi Villas,Hilltop Villas and Alila Horizon are very good examples for comparison. Any landslides so far? No. That is because of the landscape of the area. Trees and plants help to hold the soil together. Never underestimate the force of nature. I am only concern about its traffic around that area. There is only one way in and out of this project.There is also only one way in and out of batu ferringhi, provided if you want to go through the balik pulau way which will take a very long time. We can argue about the privacy of the area but i am talking about the accessibility of that area for now. Not to mention the population density along the stretch of Jalan Batu Ferringhi will increase in the near future once all the projects are ready and the occupants has taken their place in their new found homes. Moonlight Bay,Shamrock,Hilltop villas,hotels around that area,ferringhi villas and bayu ferringhi. Nevertheless, these properties are still prime properties in the near future. Many foreigners long for this kind of lifestyle. Secluded and away from the city, with the hills surrounding them and sea just a few minutes away. Not many locals will be able to afford this kind of property. These properties are build for the rich. Dear Penanglover, the Platino has its shortcomings as well. I cannot imagine how congested the area will be after the completion of pearl regency,platino and the light. The light is not a good project after all. You can read about my reviews in this website about the light. Econs 101- Supply must equal demand. At times like this, supply is certainly more than demand. Having 4 condominiums near the area will certainly push down the price in the near future. It is like a bubble waiting to burst. It is not sustainable. Btw, Bayu Ferringhi is not the only bungalow in the sky (Plenitude claims it to be the only one)....we have got the harmony residences by boonsiew development. That is a real bungalow in the sky with a private garden and swimming pool. Wow Jeremy, thank you for providing such a detailed report. I really cant thanks you enough! If the house is build on water catchment area, would it be a worry of landslide in future? cos trees cuts and plant reduces due to the development. Pls share yr views. Anyone know the selling price now ? Hi may i know whether this condo is earth quake resistance building ? from what i understand all high rise building building after year 2000 must have earth quake resistance. please check the specification of the brochures of the development for details. I have a problem & hope someone can help or advise. Last month i booked a unit of bayu feringghi condo somewhere around christmas and i paid the booking fees to the sole marketing agent by cheque at the site office as the developer does not have an office in Penang. He let me sign a booking form stating the price, unit no, my name i/c no etc. A few days later, he told me there are many buyers looking for my unit as it is the last unit at that block. When i quiried him, he assures me that the unit is mine as i have paid the deposit for it. A few days later he told me that the unit might be classified as a bumi unit and have to wait for confirmation from the developer as their sales has reach bumi quota. He assures me that i have nothing to worry as if my unit is under bumi unit, it is only temporary until the completion reaches 80% and the developer will declassify it from bumi status. However, i cannot sign the s&p yet but i have to sign a supplemental agreement stating the unit and purchase price and i have to increase my deposit by another 10k. Being a purchaser of a bumi unit i will stand to "enjoy" some benefits like the price will remain the same after the bumit unit is released. That means buy now but pay later. And i get to save a few thousand on the housing loan interest as all i need to pay now is the deposit and the balance until the completion has reached 80%. which is about a year later. I gave the agent another cheque for the extra deposit. He did not give me any receipt but acknowledge receipt on the photocopy of the cheque. A week later, the agent call me and congratulates me as the developer has confirmed that my unit is classified as a bumi unit. He says the solicitor will call me to sign a supplemental agreement soon but i have to change my cheque to pay to the solicitor's firm instead of the developer's name. He will return my previous cheques which he has not paid in yet in exchange for the new cheques. Yesterday, the agent called me to inform that he wants to return me my cheque and cancell my booking due to objection by some of the directors of the developer. It seems that one of the directors has agreed to sell the bumi units at first and has proceed to do so but the other directors is not agreeable later on. I feel very angry and cheated. How can a reputable developer which is listed on the main board of Bursa do such things? And the marketing agent is also reputable being one of the best not only in Penang but worldwide as many of their clients are from MM2H. The agent made many beautiful but very empty promises. Their agents are also listed on this very web side. What i want to know is can the developer cancell my booking after accepting the deposit for almost a month although they have not paid in my cheque? I am planning to take some legal action but i need to know if there is any buyer out there facing the same problems? The agent told me there are also other units affected. Can i lodge a complaint perhaps the Housing Ministry? I would also like to made complaints against the housing agent. Are they licenced? By whom? Please advise me if you know. We actually wanted to buy a unit as well in December. Seemed that some units were still left but only booked already, which was meaning we still had a chance if the loan from the other potential buyer was rejected. We have asked the property agent (operating for the developer) to block this unit for us anyway, in case we can still go ahead and proceed with the booking fee. After calling them many many times, they didn't come back to me. Just 2 weeks ago we went back only (as we are not living in PG) and we had to hear the same story of the left Bumi units. Being a reputable developer in Malaysia, I really do not understand that this can happen. As a foreigner, I am sure that no Bumi at all will buy this unit and there should be some way to go around this legislation. To me and to other people, this is the most unprofessional experience I have ever had relating to buying a property. Any news on the sub-sale ? when is the OC ? Heard that Completed End of 2011. How abt the sub-sale price now ? 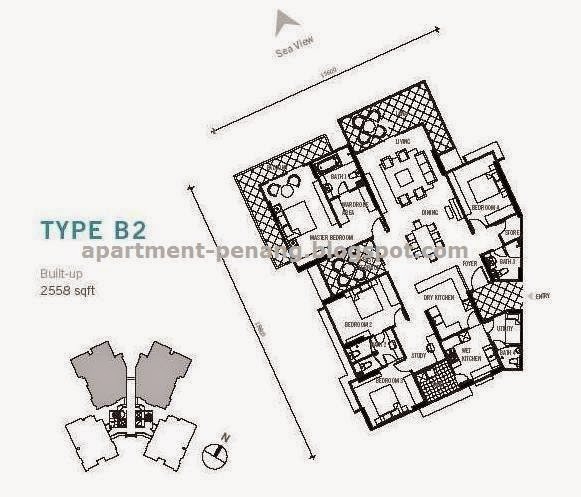 Yesterday I heard my client said the unit they bought (Type B1) is worth RM1.3 millions++. With the current selling price of 600-700 psf, it has reached some of the price in Gurney. Is this still worth it? I was told OC definitely first week September 2011 by developer. Have seen finished apartment - horrendous finish: Linoleum floors, paint on light switches, balcony rails rusting already. blocks and the carpark is about 2m off! So if you're coming from the carpark rather than a gentle slope which would suit things like push-chairs, prams, wheelchairs not to mention someone elderly, you've got to step down about 6 1ft, badly made wooden steps to get to your apartment with shopping and the like. The alternative is to take the carpers lift to the ground floor, cross the visitor's carpark - great if it's raining- then enter one of the two passenger lifts to take you to your apartment. Great isn't it. @Erik: Agree with you on the balcony rail. They should have put a glass type to further reduce the maintenance of metal railings. It is also quite risky for kids. Did not check the bridge to carpark but the bridge to the pool is definitely a little risky for kids and elderly. As for the internal finishing, did not realize that as was amused by the view from the condo. Can't deny they have a good view though not sure the price can compensate for that. What do you think? I have seen the actual unit, the finishes seen to be very good compared to other properties. Not much complaint on the finihes, but the selling point is the tremendous sea view, no doubt about it. Can anyone tell me when OC has been obtained and when (roughly) hand over to buyers has been done ? Bayu Ferringhi is really a good place to invest. I was thinking about buying a unit but after viewing it I was very disappointed. The road that lead to the condo is very sloppy and steep. Beside the tiny gym that only has 1 thread mill, 1 ecliptical, 1 beanch etc. How can a big condo be so ill equip in the gym. I also do not see a sauna which is a must in any condo. I am saving my money for other better condo definitely not this one. I'm surprised at some of the recent negative comments such as from Penang Fan; nothing is ever 'perfect'. Personally I never use a gym- I get my exercise in the fresh air but I'm not complaining about money being spent on the gym. As a resident at Bayu I would say- look at the high quality of the construction work ("unusually good for Penang" according to my contractor) the excellent layout and orientation of the units that deliver superb views from every window, and the best feature of all- the 180 degree views of Muka Head and Gunung Jerai. Of course you will have a short steep access road if you are going to be near the beach and have elevation to allow great views. Wake up and smell the flowers! 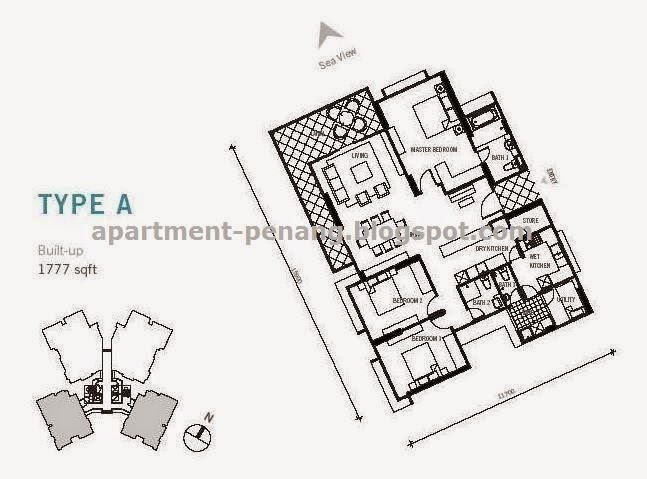 I just came back from viewing 3 units there - from the developer - and the asking prices are in the range of 1.5-1.6mil. The views are spectacular although the finishes are not up to par. I was torn between these units and another at Waterfront facing the floating mosque. The Waterfront is beautiful in its layout but seriously lacking in quality finish. Besides you pay 800+ for maintenance of a water feature-like 'swimming pool' so I am tempted to buy Bayu Ferringhi. The only catch - the price is way too high. For that price of 1.5- 1.6mil, I am now looking at Persiaran Gurney condos. While you may get a Gurney condo at this price range, they are the older ones. The newer condos are priced much higher @ ~1K+ psf. The view at Gurney would not be comparable though it has better surrounding amenities (food, shopping, transport, etc). Depending on your objective, there are pros and cons. @ Waterfront, I believe you were quoting the penthouse for that maintenance fees. I have not seen it thus do not know the layout but every unit in Bayu Ferringhi feels like a unit on its own with all rooms having breathtaking views. So what if the view in the infinity pool is breathtaking? How much time do you spend in it? There are no sauna facility and the gym.is pathetically tiny- 10ft x 10ft. 1 thread mill, 1 elliptical, 1 bench etc. It can only cater to a single person at a time which is a joke. That is unacceptable for a condo costing 3/4 million Rm and up. The architect ought to be shot. Actually the same 'so what' can be asked to all the items you mentioned. So it depends on what one prefers. While one may prefer as much amenities as possible, top class brands equipments, etc, some may prefer location, maintenance, density, view, etc. the world is such. Good health means regular exercise. B.F.Condo is clearly not promoting the essential healthy life style. Many modern folks would expect such basic facility as a decent size gym and not a cubicle. The minimalistic ill equipped gym will just not cut it. Beside this condo is the only 'Lux' that do not have a sauna. How strange! Actually, I do love the view of the Bayu Ferringhi apartments. Especially those on the high floors but the asking price for a small sub sale unit is 1.2mil so I think it is a little overpriced. I'm now so torn between Bayu and Island Resort which is under a million for a 1200 sqft unit. At 600+ per sqf, Bayu is pricey. Sigh. Does anyone know which units have a balcony in the master room? I heard it is above a certain floor up. I think Island Resort will be very beautiful condo with an even better sea view . However if all units have nice seaview, only the corner units and executive units located on the 2 outside towers will really be truely impressive and the layout of the intermediate units is not great (bedrooms with no outside view) . Facilities with large pool, sauna and so on will probably be much nicer and with the beautiful (and expensive) bungalows, the all 10 IR complex should be great but beware of what you buy. Fox...I agree with you the view from IR is great but only for the corner units. I believe they will command a premium as well for the extra window and wind flow. The middle units have only the front balcony n front window...which is a little setback. The pool is much bigger and probably the GYM too to cater for the larger density. Congrats to the buyers as well for some who patiently waited for years but now enjoyed the price appreciation. Yes, B.F.inadequate facilities is no better then most medium cost condo. At such I do not consider it as a Lux.Condo. As for being well maintain we can only judge after several years. It is still fairly new. Malaysia is know for poor house keeping. most new building only look nice for the 1st 5 years or so. After that it will be another eye sore. I have personally visited the units there and the views are magnificent and breathtaking. If i am one of the owners there i would take a stroll along the beach every morning or jog along the batu ferringhi stretch. Luxury is not only define by its facilities but also its density, the size of the units,the exclusivity that comes with the pricing of the units and the privacy. There is no comparison with Platino. Platino gym is 10 times bigger, swimming pool is 4 times bigger, not only has Platino has a sauna it has 4- 2 for men and 2 for the ladies, beside there are 2 banquets halls one big and one small, reading room, games room, tennis courts, putting green, 4 seasons garden, Penhouse has its private swimming pool on its' roof deck etc. just found out BF, Skyhome, Springtide and others which do not have sauna are not luxury condo after all...hmmm...something new to learn. What is the asking price for 1777sf now? anyone pls. at their sales office today. Hello uncle Tan, I saw a unit with my agent and it was going for 1.18mil. 1777sq ft above 24th floor. I would have grabbed it if not for my Emperor who wants to buy a beachfront property. By the way Frog Prince, we gave up on Bayu F and 10 Island Resort although I paid the initial downpayment for a corner exec unit above 25th floor. We stopped the cheque because we saw one duplex at Villa Ria and one unit at Sri Golden Bay. They are older but nothing beats walking or jogging on the beach! There is beach and... beach ! Yes, both Villa Ria and Sri Golden Bay are older. Sri Golden Bay has good privacy but not Villa Ria. If you are looking into a beach home that is quiet and serene, then probably Golden Bay is a better choice. At the sametime, for the great views of the Ocean, try not to choose one that only has 100% seaview and nothing else. Though it is great to see in daytime, sometimes it is very dark at night. This is also why BF west units are in higher demand (and probably higher price) compared to the east unit (same floor factor). While having magnificent views of the sea and Penang National Park with parasailing holiday makers dotted the beach in daytime and great sunset view, they also view the bustling night market of Batu Ferringhi at night. Off course all these comes with a price, that they are further away from the busy city. for BF, the west side is very hot due to the afternoon sun..stayed there for one night at a fren's unit and visited the night market as well. I was very interested in this project until I actually went for a viewing today at a high floor A type unit on the western wing facing Ferringhi main area. The area was fantastic, good workmanship and superb sea view. However I wonder why noone here has ever commented on the multiple broadcast stations or call it antenna if you will, that is located on the top floor of the service apartment beside the development. It seems to me the whole bayu residence project is being bombarded by the radio waves emitted by the broadcast stations directly and the swimming pool area is clearly being affected as well. I don't know about you guys but even a small hand phone has the capability to emit n receive strong signals that can cause headaches if u use it long enough on ur ear, so I can't imagine what these broadcast stations will cause to the residence there in short and long term. Please do enlighten me if you all know more about this issue as I am really being disappointed by proximity of the broadcast stations to Bayu Ferringhi. Thank you and Happy Chinese New Year. better find moonlight bay or island resort condo than this one, if that's the antennae issue. Pls call or watsapp Anthony from Popular Realty. 0124333370 or 0124338798.